Children’s clothes need to be warmer than adults’, ideally one-piece suits, washed in a waterproofing solution such as Nikwax if you have any doubt about their waterproof-ness. Mittens are warmer than gloves. Your children will almost certainly need two pairs, at least, because even if they don’t keep falling over, they’ll probably soak their mittens throwing snowballs! You can buy disposable hand and footwarmers from the ski shops and chemists. They also need a selection of clothes, longjohns, socks or tights to adjust the temperature beneath their suits. A balaclava is a must. 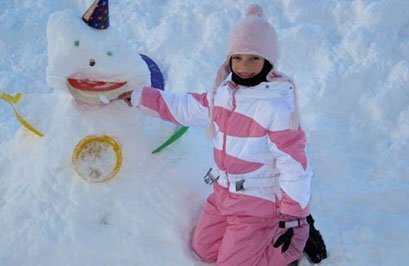 There are many shops and online stores that sell relatively cheap children’s ski clothes in the UK. Children must wear helmets, which we advise you pre-book from the ski-hire shops (and adjust to their heads when you get them). With the helmet they wear goggles, but once they stop for lunch, they remove the helmet and goggles, and need a hat or cap and wraparound sunglasses that stay on. Children need easily applied sun block (you can ask the instructor to re-apply it) and lip salve with a sun screen. Hiring skis and boots in Val d’Isère is no problem, though we recommend you pre-book equipment if you’re coming during school holidays. We list Val d’Isère Ski hire shops with discounts for YSE. To book skis, state the child’s height. For boots, the shoe size. Doing so merely gives the shop an idea of what to put aside: they will still fit the equipment properly on arrival.